When it comes to art, Dusty and Tanner know their shirt. If you’ve been to a Thunder game or have any Oklahomacentric friends then you’ve probably seen designs from Tree and Leaf Clothing. Dusty has been running the apparel store for about six years. Design is in his blood. His grandfather’s claim to fame is drawing Pistol Pete, a symbol famous throughout the country. Dusty still has his grandfather’s old design notebooks and its influence doesn’t seem to be fading any time soon. Dusty and Tanner had quite a big challange facing them last month. They had to create enough artwork for a Live on the Plaza gallery showing in two weeks time. The two tirelessly collaborated and ended up with plenty of quality work. Except plenty more good stuff from the duo in the future. Here’s the Vimeo link if you are all fancy. Last month, The Society artist Tim Krause joined us for an interview about what it’s like being an artist in Oklahoma. Krause works with a group of artists in a shared art space in The Plaza District. He’s the second artist from The Society we’ve had in the van. We are very much looking forward to more. Here’s his interview on Vimeo if that’s your thing. The only thing Horse Thief is interested in stealing is your ears. They might be after your heart too. The Oklahoma City-based band’s song “Warrior” captures the quartet’s sentiments quite nicely. With the surge of excellent music and art in the past couple years, the VDub crew listens to this song and hears a rally cry. Every day our state can become a state of mind. We can make beautiful things inside of Oklahoma. There’s no one to stop us. Also, make sure to check out Horse Thief on Dec. 10 at the ACM@UCO Performance Lab, 329 E. Sheridan in Bricktown. Deerpeople, The Non and Feathered Rabbit are opening and helping celebrate Horse Thief’s first album release. Don’t forget to check back early next week for part two of Horse Thief’s VDub Session. Here’s Horse Thief’s session on Vimeo if that’s more of your thing. Also, check out some stills after the jump. You’re not going to find a hotter band in this country. But that’s mostly because Dallas-based rockers Jonathan Tyler and the Northern Lights decided to play in OKC in the midst of the hottest summer in the our planet’s history. However, JTNL is toasty warm in other ways too. The band recently got off of a blistering tour with Grace Potter and the Nocturnals, and the Texans are working on a Fall tour. The VDub crew was lucky enough to grab JTNL just long enough for the band to bust out a brand new unreleased tune. As soon as the song was done, everyone bolted out of the van. It wasn’t because of Ferris’ driving, it was because the van become an inferno. If you don’t believe how hot it was, watch closely because throughout the new episode and you’ll see beads of sweat dripping off of drummer Jordan Cain. 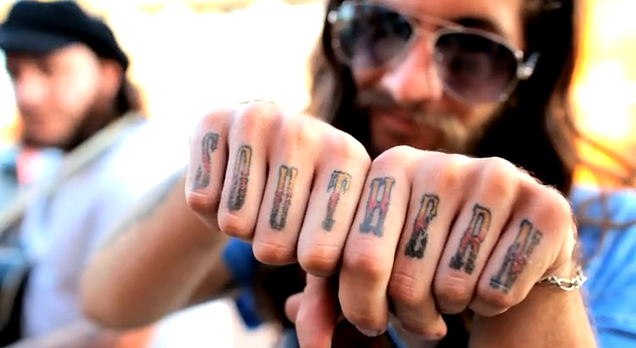 BTW, Jordan has a sweet knuckle tat. He was hanging out in the top of the camper portion of the van. We told you this band was hot. Here’s the Vimeo link if you are a big shot fancy pants video person.